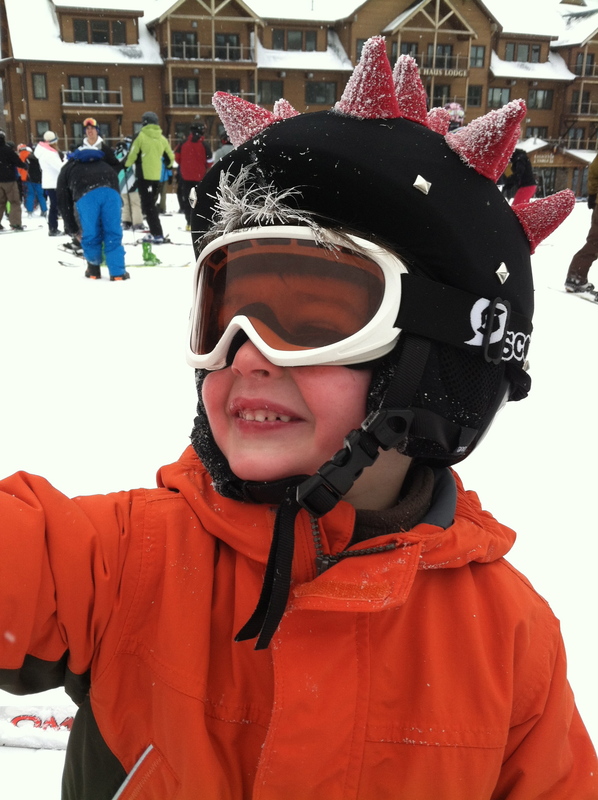 The mountain is so cold my son’s head is covered in a layer of frost, but he’s fearlessly reveling in the weather regardless. He doesn’t even have a scarf on! Brrrrr!!!!!! Close that door, it’s freezing out! has been the most often heard command in my house this week. It has edged out, No candy canes before dinner!, Don’t throw ice at your sister!, and even the recurrent Put-on-your-snow-boots-we’re-gonna-be-late!!!!! Welcome to winter in New England – five plus months of chattering teeth and cracked lips, drippy noses and numb fingertips. The cold here is called biting for a good reason. The wind has teeth and its nips can hurt. This morning I took a quick drive downtown to run errands, nestled in my car’s cozy seat warmers. I parallel parked and pushed the door open, gasping as a frigid shock of air flooded my car. Heaving myself carefully onto the slippery pavement, I skated to the curb, searching for salty spots to plant my feet. Making my way to the bank, I skidded over the brick sidewalk, involuntarily tightening my lower back muscles with a shiver and tremble, reflexively recoiling from the cold, adjusting my balance to stay upright while defending a blast of wind. I hustled into the bank and scuffed the salt off my boots, relishing a few minutes of warm reprieve before heading back into the bluster. As I walked out the door and immediately went stiff, I realized I was engaging in an internal battle against the cold – clenching my body so much my back felt achy. The discomfort triggered my mindfulness practice. I don’t need this discomfort. It’s only here to tell me something. And I’m listening carefully to what it’s saying. I took a deep breath, inhaling frigid air into my warm lungs, releasing it as steam through my mouth. Warm steam. I could produce warmth. I relaxed my tense muscles and took a few steps, continuing to walk that way until I noticed my head and neck shrinking back between my shrugging shoulders and my lower back aching once again. Then once again I mindfully melted the contraction and returned to the posture of a cold hardy New Englander. Thich Nhat Hanh would’ve been so proud of me. This time I wanted to hold onto the posture, so I envisioned warm blood flowing freely through my body, heating up my skin and keeping my muscles loose. Cold isn’t bad. It’s just another way of being. Be comfortable, I thought over and over. I considered my young children who dive into the snow hatless and spend hours digging out forts from the plowed white heaps along the driveway. Why is it they don’t seem to battle the freezing cold like adults do? Maybe it’s because joy trumps discomfort. They’re not surviving the storm; they’re reveling in it. I walked with this thought for a block or so, doing my best to fill up on joy, when another blast of wind surged, stopping me in my tracks. My head lowered, my watery eyes squeezed shut, my hands plunged deeper into my coat pockets. Be one with cold, be joyful in the cold, I urged myself, this time out loud. I looked up and caught the eye of another soul braving the single digit temps. “Brace yourself,” he warned. “The Almanac calls for a harsh winter.” I smiled and tried to feel thankful for all of the opportunities I’ll have to practice mindful freezing this year. I climbed back into my car, the radio tuned to Christmas music. “I really can’t stay… Baby, it’s cold outside.” You can say that again. This article was originally published by Vanessa Gobes on Intent.com and has subsequently appeared in Vanessa’s column “Mine to Yours” in The Winchester Star.